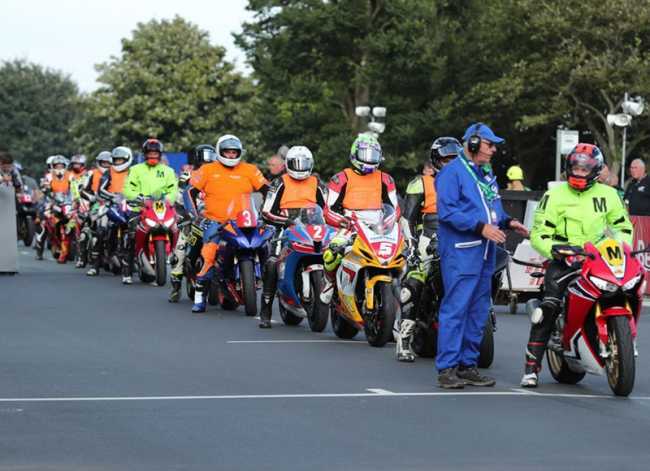 After a short delay to move cars from the course, the 2018 Manx Grand Prix got underway at 5.40pm – a delay of around twenty minutes - with an untimed lap for the newcomers. This year marks the fortieth anniversary of the Newcomers Race and this year is notable for the first Columbian rider to compete – Daniel Fernandez from Medellin. In total 31 riders are competing as newcomers in this year’s meeting including riders from France, Switzerland, New Zealand, Japan and Czech Republic. The qualifying began in earnest once the newcomers untimed lap was well underway with a session for the Senior and Junior classes. The Peoples' Bike rider Stephen Parsons from Cumbria set the early pace with a lap of 116.45 while Liverpool’s Stephen Smith, Steven Procter, local rider Dean Osborne, who won the 2014 MGP Newcomer B Race, and Darryl Tweed also posted laps in excess of 115mph. This year sees the introduction of a second Lightweight Race, on Senior Race day, as well as the introduction of the Ultra Lightweight Class, and Dave Butler and Chris Moore both posted 107mph laps while Spain’s Victor Lopez Santos, who finished fourth in last year’s Lightweight Race, completed the top three on the night with 106.57. In the Ultra Lightweight class Daniel Ingham topped the leaderboard with the only lap in excess of 100mph (100.28) with Mike Carter and Alex Sinclair completing the top three. Monday’s qualifying will see Senior and Junior machines out first at 18.20 with the Lightweight and Ultra Lightweight’s out at 19.10 and newcomers due to get their first timed laps just before 19.50.